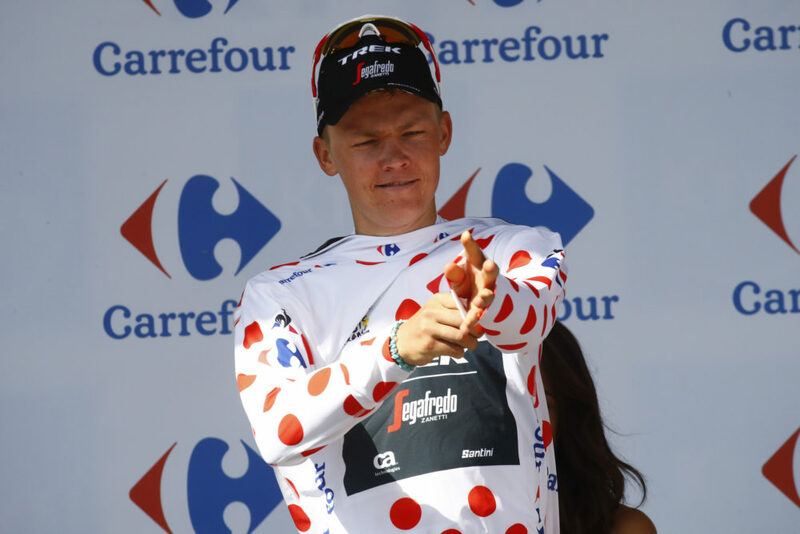 Toms Skujins won the final two categorized mountain points of a hilly stage five at the Tour de France to claim the polka dot jersey Wednesday, the first Latvian to achieve the honor. 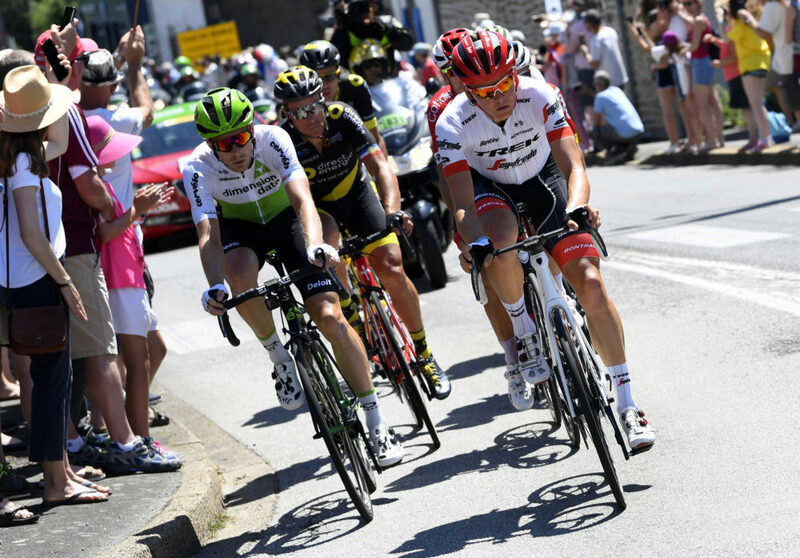 It was never the team's plan to ride for the jersey, but after successfully joining the day's breakaway of seven riders the dynamics changed in the leading group leading to a shift in tactics for Trek-Segafredo and Skujins. "First we wanted to get in the break," explained Skujins. "We had seven pretty strong guys there, and I was thinking that we might be fighting for the stage, and I was not going to waste any time on sprinting for KOM points. "But everyone has their own tactics, and when Chavanel went solo that definitely didn’t help the chances for the break because then [his teammate] Calmejane didn't ride for like 20-30kms. It changed the dynamics of the break a lot, and after that when another guy crashed out [of the break] too, it was okay, lets at least get the mountain points and combative prize." The 204.5-kilometer stage saw the first significant climbs of this year's race and had breakaway written all over it. But wishing to be in the day's escape is much different than attaining the lead group; breakaway specialists like Thomas De Gendt (Lotto Soudal) often make it look much easier than it is. "I picked a couple of moves," explained Skujins about how he managed to find the right breakaway. "And always keep an eye on De Gendt, especially when he starts on the first line of the neutral. "I jumped in a break of around 25 guys, but I knew it was too big, so I didn't really roll through because obviously, it's going to come back. And once that was brought back, and I knew that everyone is just a little bit gassed, I just attacked after Chavanel, and that was it." The breakaway rolled well until the first mountain sprint when, with still 100 kilometers to go, Sylvain Chavanel (Direct Energie) bolted. "I thought when he went he was going to sit up after taking the points or go to the next one and then sit up, but he didn't sit up until we were on his tail." Skujins' hand was forced. He went on the attack to chase down Chavanel, and his accelerations whittled the breakaway to three. After finally tagging back Chavanel on the third of four classified climbs, Skujins went on the hunt for the mountain points, dropping Chavanel and leaving only Lilian Calmejane to contend with. "Once we saw that the stage win was going to be really hard to do, then why not take some KOM points? Calmejane's a strong rider; he won a stage at the Tour, and I think the Vuelta as well. I was just happy that I could take the points over him today. 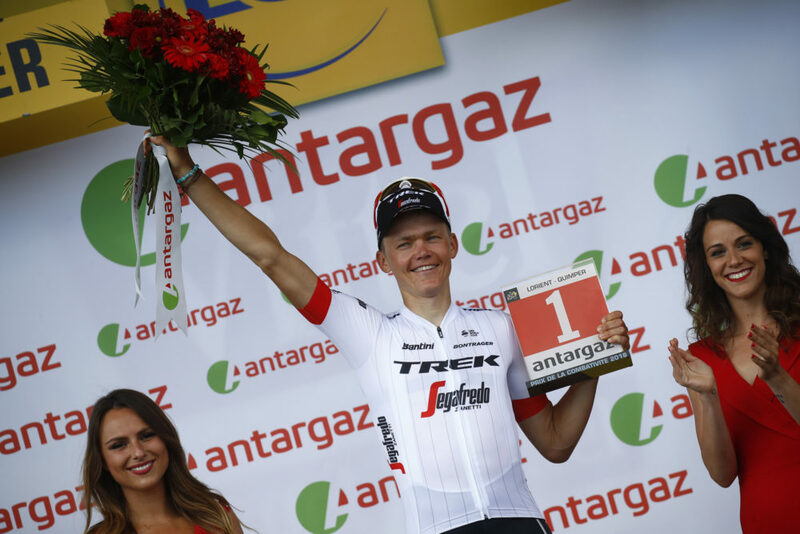 It's definitely nice for my first Tour de France – I am happy about it." Skujins successfully won the final climb to tie on points with Chavanel but saw him take the jersey by winning the final higher classified climbs. The peloton, never far behind after the escape group lost its organization, caught back Skujins and Calmejane 12 kilometers from the finish, leaving the Latvian tired but satisfied after taking the climbers jersey and most combative rider of the stage. "The Tour is the Tour - a lot more journalists, a lot more fans, and everyone is fighting for every little prize on the road," answered Skujins about his first Tour de France. "I have zero points ahead of the next guy, and I think that's good enough to hold the jersey to Paris, right?" he added jokingly.